From a 30,000 foot view, what's not to like about mutual funds? They are highly recommended by just about every financial firm, 401k provider, financial author and so called financial guru. Depending on the type of Mutual Fund, the fund can have stocks, bonds and other investment instruments held together and managed by a professional manager. Sounds great, sign me up! Before you run out and find what you think is the best mutual fund out there and invest your hard earned money into it, let's take a peek inside mutual funds and see just how well these professionally managed accounts have actually performed. Founder and CEO of Research Affiliated, Robert Arnott studied the performance of 203 actively managed mutual funds with a minimum 100 million dollars from 1984 through 1998. His research found that only 8 of these professionally managed mutual funds outperformed the market. That's just less than 4%. That means that over 96% of professionally managed mutual funds FAILED to beat the market over that 15 year period! A research paper put together by SP Global which is called SPIVA U.S. Scorecard found similar results as Robert Arnott. Over a rolling 15 year investment horizon over 94% of mutual fund managers have FAILED to outperform the market on a regular basis. A shocking study put together by Morningstar states that 49% of mutual fund managers DO NOT invest in their own fund! Now, if the professional who is managing the fund doesn't buy what he is managing, why should you?! Unfortunately, we are just getting started with the bad news. Dalbar puts together a yearly study they call Quantitative Analysis of Investor Behavior. They started this study over 30 years ago. Let me share some of their key findings. The S&P 500 has averaged 10.35% over the last 30 years. Over that same period of time the average equity fund manager has only averaged a whopping 3.66%, and that is with an all equity mutual fund. If you wanted to be diversified over the last 30 years, you would have only averaged 1.65% with Wall Street’s average mutual fund managers! Why do you think professional mutual fund managers are underperforming the market by so much? Other than bad management, the main reasons for missing the mark so badly for professional mutual fund managers are the ridiculously high fees they charge and the internal costs. In an article published by FORBES called The real cost of owning a mutual fund, you will find that the average mutual fund ANNUAL cost is between 3.17% and 4.17%! This cost is probably why nearly 50% of mutual fund managers don't invest in their own funds. It simply costs too much! To put that into perspective, the average mutual fund is nearly 60 times more expensive than the average ETF. If you were to buy $10,000 worth of a single stock, your mutual fund costs would be a whopping 6,300% more than the corresponding ETF! Did you catch that? 6,300% MORE. No wonder every financial person out there is recommending you buy mutual funds. 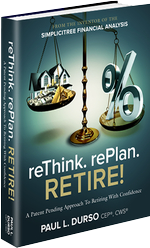 They are making a killing while you are taking all the risk, banking virtually no return, and finding yourself wondering if you are ever going to retire. The Chief investment officer for Yale University David Swanson says, "Overwhelmingly, mutual funds extract enormous sums from investors in exchange for providing a shocking disservice." Senator Peter Fitzgerald of Illinois, co-sponsor of the Mutual Fund Reform Act of 2004, was quoted saying the following about mutual funds, “The mutual fund industry is now the world's largest skimming operation, a seven trillion-dollar trough from which fund managers, brokers, and other insiders are steadily siphoning off an excessive slice of the nation's household, college, and retirement savings." Investors Beware: If you’re out there investing in mutual funds, you could be doing a great job building wealth for retirement...it just might not be your wealth.